This sweater dress is a must have for Fall. I love it and it is the perfect color. I am wearing a extra small. Also, this cardigan that I wore to the pumpkin patch is by far my favorite. I am loving this color for Fall as well. It is oversized and so comfortable. We got so many cute pictures of Andi at the pumpkin patch that I will cherish forever. Holidays are so different and so much fun with a baby. Andi is at such a fun age. We are just having the best time with her. This sweater dress is such a great piece and you look so beautiful and feminine! Amazing fall looks. Love your sweater dress and the booties! This dress is on my wish list, definitely need it! love that color with that scarf! I love those boots! And the scarf! http://trendkeeper.me .. FAST fall makeup & fall leather! Love the sweater dress! Perfect for fall! So cute! I love your pumpkin patch outfit. Love this so much! 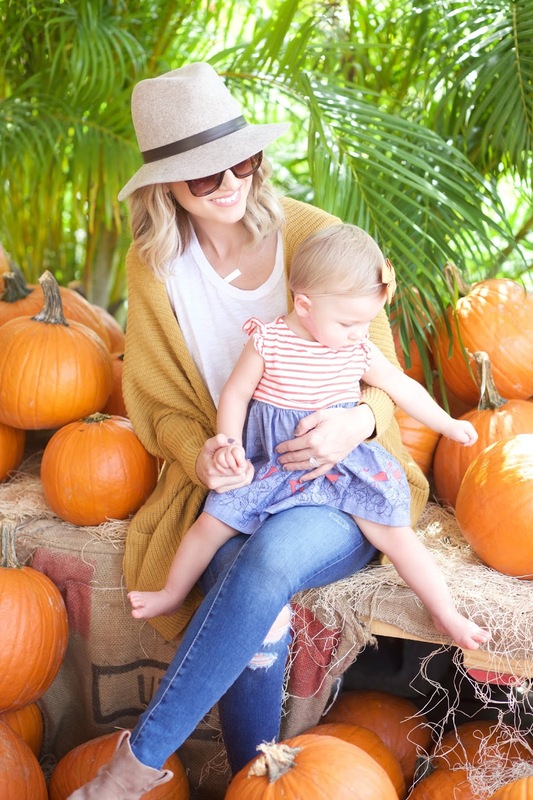 Your fall style (both home and clothes) is amazing and so inspiring!! Cute looks. I love the 2nd one. Love both of these looks! Your cardigan looks so cozy and perfect for fall! This is the perfect Fall uniform, I would definitely wear this in the classroom to do my student teaching! Aw you and Andi are so cute! Glad you're having fun making memories! Love that sweater dress! Oh the pumpkin pictures are just adorable!!! Love it so much!! Thank you for sharing! Love how you put this outfit together!